It was a “chance” ride that left some Chicagoans stunned. New video released by Lyft Monday showed footage of Chance the Rapper going undercover as a driver in the city, much to the surprise of the unsuspecting riders he picked up. The “Undercover Lyft” episode shows Chance picking up riders and talking to them about music and the importance of giving back, all while dropping subtle hints at his real identity. “When we saw the first cut of the footage it was funnier and more real than anything we had expected,” David Katcher, Lyft’s Midwest general manager, said in a statement. A Lyft rider who was picked up by undercover driver Chance the Rapper, disguised as an aspiring rapper named John, said she wasn't a fan of the rhymes her driver tried to rap for her. Chance, who told riders his name was John, even offered up a few rhymes for one rider -- but not the kind you’d expect from a music icon. The experience was intended to promote a partnership between the rideshare company and the rapper’s non-profit SocialWorks. Under a new program, Lyft riders can round up their fares and donate the difference to a cause of their choice, including SocialWorks’ “New Chance” campaign to benefit CPS. “I hope this video encourages even more folks to give back just by taking a Lyft,” Chance the Rapper said in a statement. 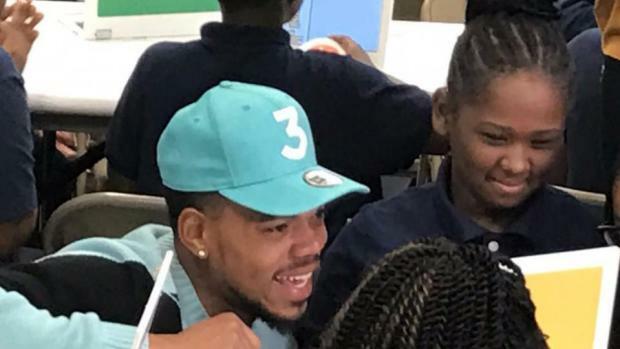 Chance the Rapper teamed up with Google to bring joy, and a BIG donation, to Chicago Public Schools. NBC 5's Marion Brooks has more.